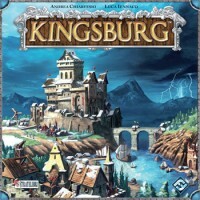 Kingsburg is one of my favorites to pull out when I’m playing with just one other person – both of you get to work on your “Plan A” with minimal risk of having your plans ruined, and Winters provide enough uncertainty that even a better thought-out and executed plan can fail if the King’s support die roll is unlucky. The game works well with 2 players because the extra sets of dice you roll to make certain Advisers inaccessible each turn knock out high-numbered spots (I’ve never had these rolls take out an Adviser lower than 5). This leaves a handful of low-level Advisers open for your spare dice at the end of your turn. In 3- and 4-player games, however, the players controlling those extra sets of dice will frequently place their low-level dice individually (as you will). You are FAR more likely to find yourself sitting on a die you can’t place at the end of your turn… and if that die you can’t place was producing a “linchpin” good imperative to your building plans, your “Plan A” may be permanently compromised. Now you have to switch course mid-game, and have little chance of recovering. To make these situations less antagonistic, I use the following house rule: if you have just one die left to place and no legal place to play it (after factoring in +2 tokens, the King’s Envoy and the ability to “sway” your die face 1 in either direction), you may reallocate ALL of your dice placed that turn in order to use all of them. If you have a 3 remaining but all Advisers between 2 and 6 are unavailable (and you don’t possess the King’s Envoy) – but you HAD to score a Gold this turn – you can sacrifice whatever spot you claimed with your previous 2 dice (likely a steep price, as you played these first so the Adviser they’re on must be important to you) and go for a higher-level Adviser that can nab you the Gold to keep your plans on track. You can also include previously-placed +2 tokens in this reallocation, as well as re-use a +1 or -1 sway granted by the Market provided you are removing the die/dice these abilities were previously tied to. One of the great aspects about this game is that you are not only trying to get the most out of the round, but you are also trying to affect the outcome of the round for your fellow players. More often than not, passing on putting all of your dice on the King, to instead place on the Queen and the Jester is a much better play. Also, you may want to sacrifice a die (or two) to insure that your opponent does not get a chance to influence the General so that they do not get a chance to peek at that seasons enemy card. Remember, the key to Kingsburg is not influencing the highest advisor but being in control of who has access to the key advisors. Three resources! Two recourse is the standard, but not what you should be settling for or satisfied with. Very one is getting two resources. Your goal should be to manipulate your die to offer you three resources. Even if you are breaking your higher number into three separate numbers, if you can get three resources that is what you should be going for. The Embassy has the highest potential return for victory points for any one building. The sooner you are able to build it, the more points you’ll gain. While you’ll only gain 7 points from the buildings, each turn after that, you’ll gain more points. If you build the Embassy as soon as possible, you’ll be able to gain an additional 12 points, plus you’ll be able to exchange excess goods or +2 tokens for additional points via the Town Hall for another potential 13 points in the game..
To build up to the Embassy, you only need 2 gold, 5 wood, and 4 stone, and you’ll have to build the crane along the way, so any buildings in columns III and IV are cheaper and easier to build. All this lines up with advisors 7 and 12 very well. They are common dice combinations, especially 7, they let you be more selective with what resources you gain, and you’ll be rolling in +2 tokens, which helps get to 12, or can trade in for points. And unlike a building like the Cathedral, if you lose the Embassy from an enemy, you actually aren’t losing a bunch of points in return, so it allows a little more high-risk decisions at the end of the game. This is really only half-strategy for a game, as you’ll need to find what else to do after you build the embassy, but it does allow you to invest in a stronger military strength or even take a risk with going after a Cathedral. Just try and get +2 tokens, and you’ve got a very powerful set of buildings. There are alot of tips here about not going for the highest advisor and, for the most part, I believe that’s true. I roll low all the time and still manage to get alot out of my rolls. But the Queen…..THE QUEEN! Our playgroup as more or less decided that if you can hit the queen, there’s no reason not too. We even joke that the winner of the game is usually whoever lands the queen the most. As the game is getting set up take a close look at your building option and try to start planning something. Rushing to get Crane for decreased gold cost or Farms for the extra dice can make the game much easier to win. When playing with larger parties your ability to influence will quickly dwindle as more players are filling the same amount of spaces on the board. This will make your ability to manipulate your die results, and the use of the Merchant path buildings, more important than in two or three player games. If you are going to utilize these buildings in your game it is best to make the Inn the very first building you construct. The Inn offers you a +2 token every summer. However there are only five summer seasons in the game. If you can construct this building in your first season then you will be able to use it in your first year. A twenty percent increase verses waiting on it for the second year. Usually I will building defenses first and move forward from there, but I have developed this strategy with larger groups and made my second building a defensive construct while the attacking armies are still small and weak. We have found that the Kings Back Up Troops add a bit too much support and that we like to watch civilizations tumble and fall. To reduce the effect of this mechanic modified the results of the die rolls. Of course it means that the defenses paths of buildings are more important, but it also makes the Sargent and General Advisers much more important as well. Unless this is your first time playing you should have a general strategy and know what buildings you want to build and most likely even in what order you want to build them all. However, the resources you collect or fail to collect and push you into a certain path and you should go with the flow. Let’s say you know later in the game you want to venture down the religion building path and collect some of those big victory points, but early you want to build your defenses. Good Strategy! However due to die rolls or player placement you don’t have the resources you need to create your Barracks. But you do have the two gold you need for your statue. Build that Statue! You only have so many rounds that you can build in so you want to use as many of them as possible. Especially early in the game you want to build something every season that you can. If you can stay even or in the lead for most buildings you will gain an extra victory point over those who are waiting and this is a great “rich get richer” mechanic you need to exploit. If you have the expansion, “To Forge a Realm”, this row is a MUST! You can easily finish this row by the third year and then it’s nothing but free victory points and military for the rest of the game. You can also you all that extra gold to build up the Statue, Chapel, Church, Cathedral row, for even MORE points! If you have the game and the expansion, but haven’t played this one much lately and want something to stimulate interest at the table I recommend you go to the Fantasy flight Games site and look at the Kingsburg page. There you will find 5 scenarios the company posted to give you some variety while players waited for the expansion to come out. Try them out and I think you will find new enjoyment in the game. I often play this game with players who complain about not rolling high, while I often do quite well. The secret is to split up your dice rolls. If you find yourself with a low roll, you are much better off to split into three even lower numbers then to lump your entire roll together just to get one or two goods on a high number. By splitting the number up, you’re usually guaranteed at MINIMUM two goods and usually 3 or more. Roll two D6 and the difference between the two dice is the King’s Aid. I almost always build the Crane (bottom row, column II), which reduces the gold cost by 1 for columns III and IV, early on since gold can be hard to get. We implemented a house rule because we thought the King’s Aid was a bit too powerful and encouraged players to ignore military. We reduced the King’s Aid role in step 8 from 1d6 to 1d3. It seems to work pretty well and has everyone terrified when we approach the end of Autumn. As with many game mechanics (and general life situations) you want to build your base first and grow up and out from there. In Kingsburg your base is going to defenses. These should be the first buildings that you add to your land. The only threat that you have of losing anything you have built is due to a lack of defense. Do this before winter season comes and the hordes attack, then you can move forward with building the nicer buildings.